Teachers Trump Psychologist? Who Decides Eligibility? When you have a disagreement between the teachers and the school psychologist about whether a child qualifies for services, you must consider the real question that needs to be answered. “Does the child have a disability that adversely affects educational performance?” If the answer to the question is “yes,” then the child is eligible under IDEA. I am a special education teacher in a small school district. We tested an ESL student to see if he qualifies for services. Based on the evaluation, the school psychologist recommended him for special education. But, the student’s teachers at his junior high school said the child is not eligible. Can these teachers override the recommendation of the school psychologist? The IDEA sets out a series of steps that must be taken before a child is determined to be eligible for special education and related services. This is not a decision made by the child’s teachers or the school psychologist or the principal alone. It is a decision made by a “team of qualified professionals” after the child has been evaluated by various professionals. use the results of the evaluation to make an eligibility decision. There are several requirements about this evaluation. 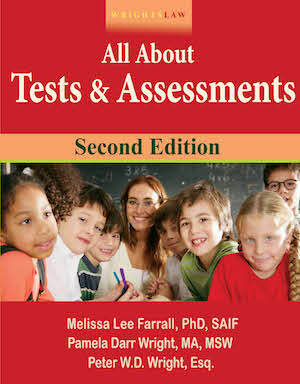 The school must use a variety of assessment tools and strategies to gather relevant functional, developmental and academic information on the child. This includes information provided by the parent. 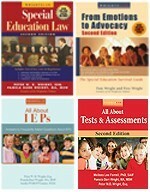 These requirements are spelled out in IDEA 2004, Section 1414 about Evaluations, Reevaluations, IEPs, and Placements. The law about eligibility for a child with a specific learning disability changed – there is no longer a requirement to use a discrepancy formula. At the same time, Section 1414(b)(2)(B) says the school may “not use any single measure or assessment [such as RTI] as the sole criterion…”. The Federal Regulations 300.310(b) also say that a child suspected of having a specific learning disability must be observed in the regular classroom after the child has been referred for an evaluation. The question is not about which recommendation can override the other, rather what is stated in the law. 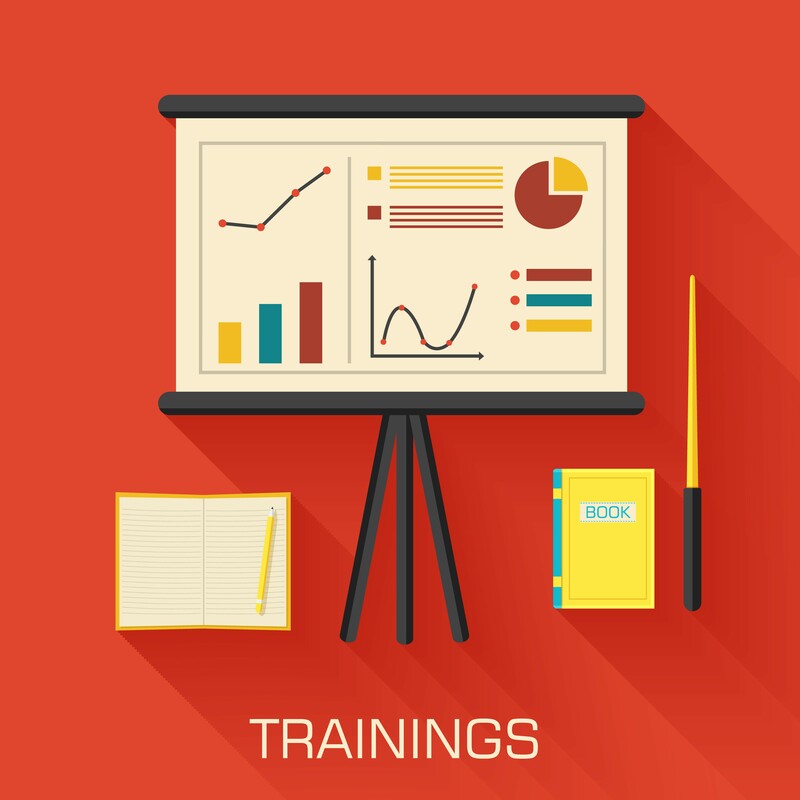 The requirements for eligibility and evaluation are spelled out in IDEA 2004 and the Federal Regulations. 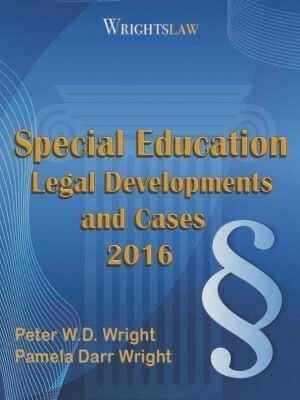 This entry was posted in Advocacy, Eligibility, FAPE, IDEA 2004, Special Ed Law, Special Education Regulations, Tests & Assessments and tagged Discrepancy, Eligibility, ESL, Evaluations, RTI, Specific Learning Disability by Wrightslaw. Bookmark the permalink. What happens when a school psychologist agrees the child has a disability but is in open disagreement with the teacher, parent, and child’s therapist about whether the child needs services (even though her own results would support the need in court). Is universal agreement by the team needed? 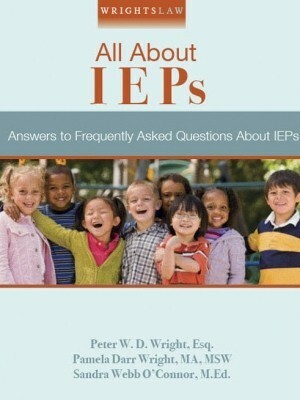 Or is it more appropriate for an IEP to be given and the psychologist can disagree with it? Are teachers allowed to make personal comments on your child’s evaluation or comments beyond their scope of credentials like “no autism spectrum”, “No evidence of repetitive language or noises”. These comments were not checked but hand written as notes. I would think no evidence of repetitive language or noises would be appropriate as that statement is based on observable behavior. I don’t think a teacher can say if a child has a diagnosis or not though. There is a student in my building who just went through the eligibility process. He was found eligible under OHI for ADHD. The teacher and others in the eligibility meeting were in disagreement with this decision. He was evaluated for ASD and was found clinically significant and highly probable. He is in the 1st percentile in both his math composite score and written expression. 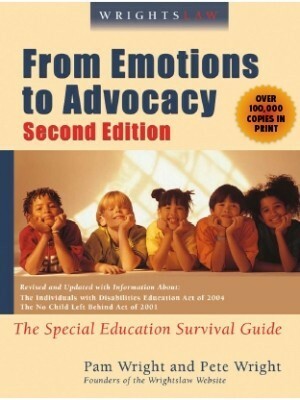 LD was never looked at and ASD was dismissed because the school psychologist did not believe he showed these signs. At least 3 individuals at this meeting were shocked at this. They were in complete disagreement with his diagnosis which was supported by the school psychologist and the assistant principal. 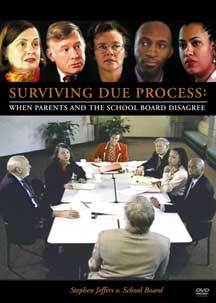 What rights do they have, as educators, when they are in disagreement with the decision. Do they have a right to file an appeal and is it too late? What would be the next step, if any? Grandparents are raising him and there is very limited home support. Chris, The law about evaluations is in 20 U.S.C. 1414(a) (b) and (c). Those 3 subsections are the key. There is nothing in the statute or federal regulations that addresses “absences from math instruction” or “only 30 days of school left” as a reason not to evaluate. If a child has a marked diagnosis for example, Down syndrome. Does she need to have a Psy. evaluation to be eligible for special education services? How can I fight for what my son needs when the school stonewalls me? 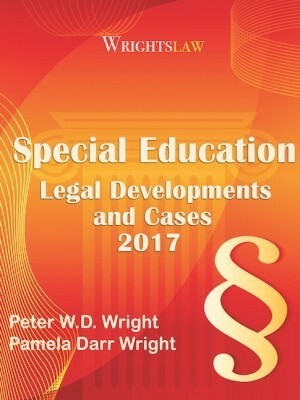 Kim – IDEA 2004 says that a child does not have to fail to be eligible for special education services. 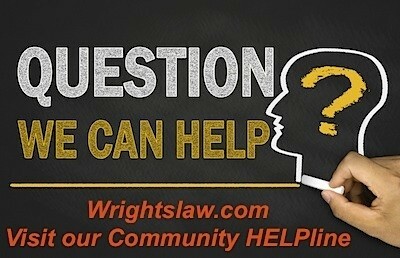 Now go to any page on https://www.wrightslaw.com/ and enter the term “passing grades” in the search box. You said, “The school says he can only have a 504 unless he is failing.” Where did the school get this information? Try the term “unwritten school policy” in the search box. See what you find out. 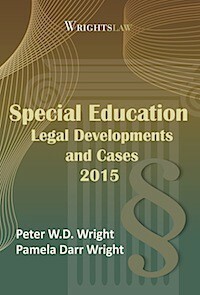 My state is one of 10 that recently got waivers from IDEA, so now what is the law governing eligibility for special education for a specific learning disability? Very confusing area. My child is bright, but has diagnosed ADHD, ODD, depression, and suicidal tendencies, as well as the worst genetics imaginable. Has been in 5 rehabs this year including 6 months therapeutic boarding school. School said our 17 year old has maturity of a 10 year old and they are right on that. They refuse to do anything but a 504. They suspended him 20 times and then said 17 were manifestations of his disability, but did not expunge them. I am fighting in court with final hearing this Friday. Parent’s can’t win, which means the child suffers a lifetime. DAvid, I think you need to get a special ed attorney and fast. You have to prove that your child did not receive proper services and that that played into his arrest. It will be a hard road but it is the only way I can think of to help you at this time. We are currently having this exact same thing going on with the school district my son is in. We have been denied services & accommodations since summer of 2009. Even after providing documentation from doctors, psychiatrists, counselors, therapists & other proof of his disabilities which are Aspergers Syndrome and ADHD. After being denied he continued school and a few months later got arrested at school and charged with a first degree felony. They expelled him for 2 years to top it off. We are trying to fix this. HELP PLEASE! Jennifer V – I believe she is out of compliance. Do you have a special ed director you can go to for help? 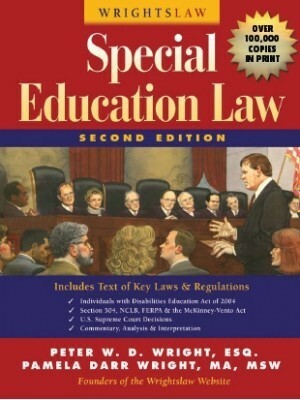 If not what about your state department of education usually has a special ed staff that knows the law. They need to to do their job. Usually the department of ed has a web site with a separate web site for special ed with lots of information. I am a public school teacher and have to fight tooth and nail to get students to qualify for special education, or to even get a fair evaluation by our school psych. She requires a diagnosis to qualify a student. Last year it took almost the entire school year to have a child receive services, he did qualify, and later in the summer did receive an autism spectrum diagnosis. This year I am fighting the same battle with yet another student. This child is not successful in the gen ed classroom and has not been successful for 2 years!! Now she requires the parent to take him to a Doctor at the parents expense to get an anxiety diagnosis renewed because he received this diagnosis three years ago. Is this against IDEA? Is she out of compliance or am I expecting too much from the Special Education Department? Becky The school can use the discrepancy formula. It is not against the law. However they need to use other forms of assessment as well. Sometimes there are larger discrepancies in the subtest scores that when averaged out cause the discrepancy to not be met. You can question this and get an outside evaluation with a specialist at public expense to see what that person comes up with. This happened to our son and we ended up keeping him in special ed with a less than 2.0 discrepancy score due to other issues and discrepancy scores on the subtests that proved that he still would benefit by special ed services. My son’s school uses a discrepancy formula. Is the school in violation for using this method? Should I write a letter questioning them on why they still use a discrepancy formula even though the law has changed? And who should I write it to? I have a son, we are getting him private speech help. The school decided that he didn’t qualify for services (he is gifted but performing w/in the low avg range- thus considered able to access the curriculum). I have requested the raw data from the speech tests that the school conducted because it would be helpful to the Drs working with my son, and the results are germain to his issue. The Director of pupil services tells me that the school is not obligated to provide this information. I do not believe she is correct and pointed this out, with info from WrightsLaw website. What can I do? She doesnt care what I say, or what my rights are. I am a special education teacher in a large school district. Sometimes teachers and the school psychologist disagree about whether a student qualifies for special ed. “Adverse impact” can be a very subjective issue. I have participated in a change of diagnosis, especially if the student is young. Sometimes, ADHD masks a more severe learning disability and sometimes they go hand in hand. My personal experience is that some very inexperienced psychologists are working in school. Ask if the school has a psychologist on staff who can perform a neurospsych evaluation and who has a doctorate. Good luck. Wow. I am looking for a research based methodology to address an ADHD problem my son is experiencing which affects his ability to focus in class and learn the material. We had gotten a private eval two years ago and have been trying to get services ever since. But I don’t have a research based program to offer, just one/one instruction which I am paying for out of pocket. I just asked for a reeval and the result was just similar to an example given in a recent seminar I attended, the school came back and said now they do not believe he even has ADHD any more! I have a daughter in her final year of high school. I have requested a psychological test be conducted, she has not had one since middle school, so we can have a better idea if we should transition her into further edu. or VR. The school is opposing on the grounds she is leaving anyway. Also is she entitled to stay at high school until the age of 22 regardless if she passes her high school diploma? This school has definitely not been supportive. There are court & hearing officer cases where the parents were able to prove eligibility for their child at least partially by showing the amount of effort that was put in by the family & the child away from school. I am sure that the Wrights can point you to where to find some of these cases on the website. Thank you for this post. I’m a mother of a child who is hard of hearing – and have been in contact with other parents dealing with the same. Hearing loss is often refferred to as the “invisible disability” – and boy – does it feel that way sometimes. If your child is not failing school… and since they are not completely deaf – many seem to think they do not, or should not, qualify for special services. Of course, that is simply not true. This website, and your books have been such a help to me whenever I needed it. I wish I had known about it from the get-go. This is a question I see time after time. When the parents are providing support at home, and the child is spending 3 or more times the usual hours for homework, with perhaps outside tutoring thrown in (paid for by the parents of course), and is passing, I frequently hear “Functionally, the child shows no adverse affect on their educational performance.” Unless parents are willing to let their child fail, sometimes schools do not see eligibility. This is frequently the time parents become very frustrated. Sometimes they go to the Superintendent of Schools. Sometimes, they badger the committee members. Neither technique is very effective. This is the time for what I call “pleasant persistence”. Ask the school what we would see if there was an adverse affect. Find out what their perspective is. Keep asking. Find their key.